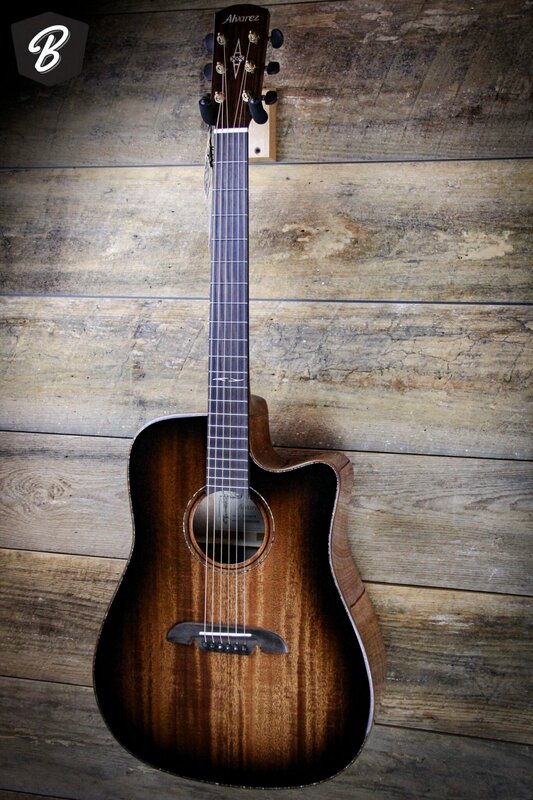 The Alvarez MDA66CESHB is made from a hand-selected, solid African mahogany top, and solid, fully-cured African mahogany back and sides. Each component is made of natural material, including real bone saddles and nuts, Acacia Koa binding, Paua Abolone purflings, ebony bridge pins and green abalone inlays. Masterworks guitars feature a one-piece mahogany neck with a 50/50 finish, premium tuners with ebony buttons, and 12th fret abalone inlay. The Masterworks bracing system is forward-shifted with scalloped, hand-finished X braces that allow these guitars to project incredibly well. There's lots of sustain and dynamic response. Either strummed or picked, the separation and balance across the strings is unprecedented in this price range. The SYS650 preamp with built-in tuner accurately captures all of the raw power and detailed tonal textures of these incredible instruments. Thanks for shopping with BME!